Kingsford, MI May 1, 2010 Nelson Paintballs - Nelson Paintballs, the Inventor of the Paintball, has introduced Deter-it CRASHER Glass Breaking rounds for law enforcement and military agencies to complement its line of Deter-it Less Lethal kinetic energy rounds. 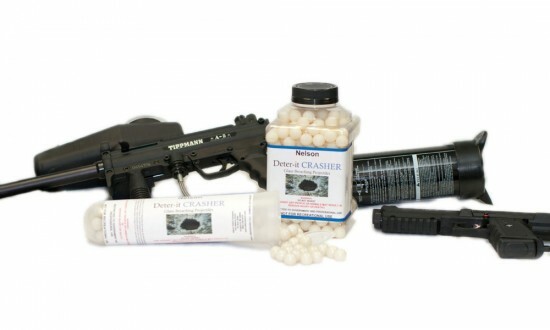 Rick Louys, President of Nelson Paintballs, said, ?Nelsons Deter-it projectiles are in use for less lethal applications by local, state, and federal agencies throughout North America. The addition of Deter-it CRASHER is one more step in rounding out our tactical product line. Nelson has a long history of solving problems that exist for its customers. We created the solution to tree marking needs for foresters, we created paintball technology, and now we are proud that we are providing solutions to tactical situations faced by military and law enforcement agencies the world over. Nelson is the original inventor of the paintball, and has been selling paintballs since 1960. Nelson offers a full line of recreational paintballs, other paintball equipment and accessories, clear training projectiles, red-colored fill training projectiles, Deter-it tactical projectiles, SOC Tactical Gear, and EOTAC Clothing.